The latest report by Persistence Market Research titled ‘Wind Turbine Rotor Blade Market: Global Industry Analysis and Forecast, 2017 – 2025’ gives a comprehensive outlook of the global wind turbine rotor blade market. The report starts with an executive summary that gives the pertinent market numbers and the main regions where the growth will be concentrated along with the main segments as per the market taxonomy that are slated to perform exceptionally well in the global wind turbine rotor blade market. The executive summary also lists the main drivers, restraints and trends that are applicable in the global wind turbine rotor blade market along with a listing of the main market players, which are then profiled individually in the competitive landscape section. 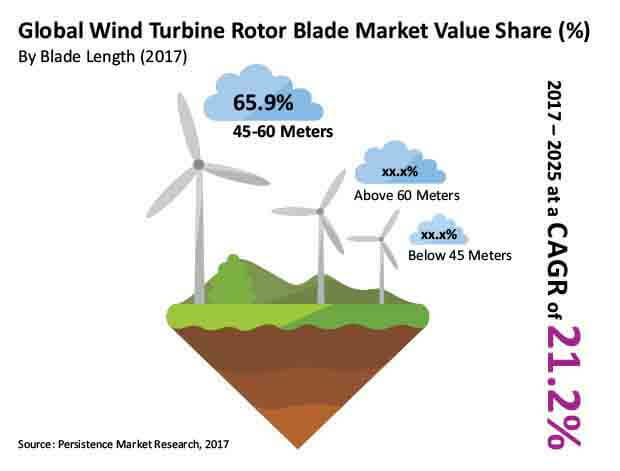 The executive summary also lists the global wind turbine rotor blade market share by blade length, by material, by application and by region. At the end of the executive summary section, concise and yet important information regarding the overall market approach adopted by key market players in the global wind turbine rotor blade market along with the most attractive target application and most attractive target region and the differentiating strategy adopted by the key market players is also given. After this, there is a section on the market introduction that states the market definition by blade material and by application. After this section, there is an important section that defines the market taxonomy of the global wind turbine rotor blade market. The detailed market taxonomy is stated as under. After the market taxonomy section, there is a section of the report devoted to the global wind turbine rotor blade market analysis scenario, which analyzes all the regions as given in the market taxonomy and lists the fastest growing and the largest regional market for wind turbine rotor blades. After this, the global wind turbine rotor blade market volume analysis is given for each segment as defined in the market taxonomy for the years 2017 and 2025. Next is a highly informative section that explains the global wind turbine rotor blade market price comparison for 2016 for each region and lists out the weighted average price range. There are some unique sections in the report that give a deep insight into the global wind turbine rotor blade market. They include the industry road map, product lifecycle stages, life cycle cost and carbon emission analysis of wind turbines and the impact of utilization of wind energy in offsetting carbon emissions. This section of the report subsequently contains information about the global wind energy cumulative installed capacity, DNV GL standards for wind turbine rotor blades and a list of recent patents in the field of wind turbines. After this, there is a section on the upcoming onshore projects related to wind energy generation, upcoming offshore projects for wind energy generation, and an informative comparison of wind energy with solar energy and non-renewable energy sources. A section of the report states the interesting investment opportunities in the wind energy generation sector and the macroeconomic factors impact analysis for each region. Another section of the report is devoted to explaining in detail the market drivers, market restraints, market opportunities and market trends in the global wind turbine rotor blade market. This section gives a comprehensive analysis of the factors responsible for encouraging the propagation of the wind turbine rotor blade market and the factors that hamper the growth of the wind turbine rotor blade market. After the market dynamics section, there is a section in the report that explains the global wind turbine rotor blade market value chain. The subsequent sections of the report state the analysis and forecast of the global wind turbine rotor blade market as per the segments given in the market taxonomy. These sections contain important information like Basis Point Share analysis, year-on-year growth rates, absolute dollar opportunity and the global wind turbine rotor blade market attractiveness index for each of the segments. Last but not the least, there is an entire section of the report devoted to the competition landscape of the global wind turbine rotor blade market. This competition landscape gives a dashboard view of the key companies operating in the global wind turbine rotor blade market along with their important information and broad strategy adopted to stay as leaders in the wind turbine rotor blade market. Each of the leading companies is also profiled individually and important information about the company such as company details, company description, product portfolio along with key developments concerning the company and strategic analysis is presented. A SWOT analysis of each leading market player is also presented, which gives detailed information about the strengths, weakness, opportunities and threats. This competition landscape is the most important section of the report as it imparts a deep understanding of the leading companies operating in the global wind turbine rotor blade market and is valuable for new entrants in the field to get a learning about how the companies are leading this lucrative market and also for the established market players in order to get a better understanding about their competitors. Overall market size has been analyzed through historical data, primary responses, and public domain data. Revenue of companies in the global wind turbine rotor blade market has been benchmarked to ascertain the market size for the base year. Macroeconomic indicators such as GDP and industry growth have been considered to forecast the market size over the forecast period. The historical growth trend of end-use industries, market participants’ performance, as well as the present macro-economic outlook has been taken into consideration for estimating the overall market trend forecast. This data is then validated with the help of the triangulation method and is extensively scrutinized using advanced tools to garner quantitative and qualitative insights into the global wind turbine rotor blade market. Sales of wind turbine rotor blades is expected to be valued at more than US$ 7,000 Mn by 2017 end and is anticipated to register a CAGR of 21.2% and be valued at nearly US$ 33,000 Mn by the end of 2025. Asia Pacific – led by China and India – will account for a major share of the global wind turbine rotor blade market between 2017 and 2025. Generation of electricity from wind is now firmly established as a mainstream source for power generation. Capacity of wind power has significantly increased across the world, as wind turbines have become more powerful, efficient and affordable for power producers in the last decade. These factors will create a positive impact on the demand for wind turbine rotor blades, as they are an essential component in wind power projects. Wind energy is a relatively large single source (around 50%) of all increase in electricity generation globally. To give an example of the importance and growing clout of wind energy, wind energy accounted for around 40% of Denmark’s total power generation, 23% of Portugal and Ireland, and 19% of Uruguay. In South Australia, wind power contributes to around 40% of the total power generation. In the Paris Climate Change Conference of the Parties (COP21), the long term target adopted by 186 countries that attended this conference is to make the power sector 100% emission free by 2050. This strengthens the position of wind energy as a major portion of renewable power will be supplied by wind energy, along with solar energy. China and the United States are the major producers of renewable energy. As the generation of electricity from wind creates no emissions, wind energy will play a major role in helping the two countries meet their commitments under the COP21 agreement. This will create a big boost in the sales of wind turbine rotor blades in the coming years. Technological innovation since the last decade has created significant improvements in terms of wind power generation, but this innovation has come at the cost of increasing the length of wind turbine blades. Hence, the limits related to maximum operable length may put on hold new installations, due to problems associated with transportation and on-site installation of large rotor blades. However, on the other hand, solar panels are shrinking in size, due to improvements in their technological efficiency. Being an important source of renewable energy with no moving parts and no noise pollution, solar panels may pose a threat to the wind turbine rotor blade market on a large scale. Generation of renewable and clean sources of energy from offshore wind is a relatively new technology and has just taken off in many countries of the world. The rotor blades required for such harsh offshore environments require more technological advancements in terms of design and build. As of now, offshore wind power installations are mainly concentrated across Europe. However, countries such as China, Japan, South Korea, India, Taiwan and the United States have approved many offshore projects, which are under development and are expected to be operational in the near future. Among the blade length segments, the 45-60 meters segment is estimated to be the largest segment, accounting for 65.9% share in terms of revenue in the global wind turbine rotor blade market by 2017 end. This will be followed by the Above 60 meters segment. The 45-60 meters segment is expected to retain its dominance over the forecast period, registering a CAGR of 19.1% in terms of value. The Below 45 meters segment is expected to hold a market value share of 12.1% by 2017 end. Sinomatech Wind Power Blade Co.